Displays Interfolio icon, copyright mark, year. “Program Policies” links to a marketing page with all of our policies. When Administrators with multiple levels of administrative rights click on a Faculty180-related item (Home item or left nav link), they see a modal with the ability to choose the appropriate set of admin rights (level of access). 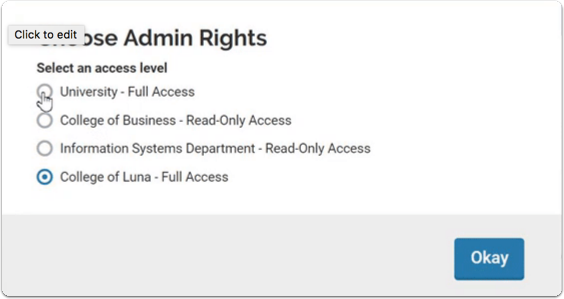 The "Choose Admin Rights" option that was utilized in the user's drop-down menu of the old UI is no longer there. Moves to the footer, and pops up when you first enter F180, shouldn't pop up again unless you enter/exit emulate. When a user clicks on a "Faculty" section, then navigates to an Admin section under the Admin drop-down, when the new page loads, the Admin drop-down now remains open. Overview: With the release of the new Interfolio Home experience, we have created a central, place to manage the different branding and customization options that are currently available to clients, in Search/RPT, and Faculty180. When an administrator at the highest level of the institution (for any product), selects the name drop down (User menu) they will see an additional option for "Branding Settings" under a header for the institution. When they select the "Branding Settings" option they are taken to a page where they can manage their my institutional logo, and primary color, and can save, cancel, or reset the branding. This screen looks a little different from what is there now: a background of the saved primary color appears behind the logo, which is by default, the Interfolio logo behind a dark blue background. Note: Email functionality has also been updated to include new branding implementation. The old F180 export buttons at the top of the screen are removed. When a user viewing a vita output clicks “Export/Share > My Interfolio Dossier,” a modal appears that lets me export the vita to the Dossier account connected to my PID and (optionally) choose a collection for which to add the vita. Text above "Exporting to..." says: "This will export a PDF version of this vita to your personal Interfolio Dossier account. You can use that vita in a review, promotion and tenure processes or searches run through Interfolio, or simply store it for later." Text below "Add to this Collection" but above the drop-down that says: "Collections let you combine documents in your Dossier into packets for easy submission to review cases or searches." When generating a vita in Vitas & Biosketches, the configuration box has been redesigned. Title of box goes from: "Details" -> "Vita Options"
"All" option is moved to the top of the date range section, with separate radio buttons for "All" or "Custom"
When a user views Vita export options and clicks the Export/Share button (if they have been provisioned for Dossier Institution for this dbID), they see "My Interfolio Dossier" in the list of options. If they click the Export/Share button and have been provisioned for Dossier Institution for a different dbID but not this dbID, they will NOT see "My Interfolio Dossier" in the list of options. If they click the Export/Share button and have NOT been provisioned for Dossier Institution, they will NOT see "My Interfolio Dossier" in the list of options. When viewing Vita export options while emulating another user, they will NOT see "My Interfolio Dossier" in the list of options. Users in Canada will not see the Export to My Interfolio Dossier option. The Quicklinks button that previously lived in the F180 header was moved to the page header. All Export and help icon buttons were moved to an "Actions" drop-down button. If there are no help or export items, the button shouldn't display. Action buttons and Quicklink buttons work as expected. Active menu items still work, and drilling down a section still has the correct section highlighted. Now, we only show the "Interfolio Announcements" section if there are announcements to display. We only show client-specific announcements section if there are announcements to display. On the Announcements & Help screen, we added configurable institution support information. (configurable under Setup > Details). Use the field "Help Link Shown To Users" as the section header and the content in "Details For Help Link" as the body for that section. Faculty180 users now see a "Find Colleagues" link in the left nav for that feature (formerly known as "faculty search"). The "Find Colleagues" feature helps users find colleagues at their institution by their searchable activities using filters and keywords. Results of the search are presented in a table on the same page. When a user clicks “Contact information” next to a result (listed under the “View” column of the table), they get the contact info in a modal. When there are no results, an error message appears reading: "There are no results for the filters you've selected. Try changing the filters by selecting another input area, changing the unit, selecting a different date range, or using another keyword." Renamed page header from "Access Settings" to "Account Access" (to be consistent with nav). Removed the collapsable "Account Access" heading. Renamed “Access Granted to My Account” to "Users Granted Access to My Account"
When a user is included on an initiated activity input form, they can see a home item for the activity input request and a link to complete it. There are now breadcrumb links on the top of every full page in the format Home > Parent Page > Current Page. When an enterprise user navigates to a page in the app, the institution name is the first breadcrumb and links the user directly to the home. For an Administrator configuring a section (e.g., Teaching) on an input form in Setup -> Activity Input Form, the field currently labeled as "Allow in Faculty Search" should be relabeled to "Allow in Find Colleagues." Note: Interfolio Admin > Settings table has the label in the table heading versus the key that was previously used. The key will still be available in the help modal and everything should still be in the same order. In Administration -> Communication, admin can no longer create a custom Dashboard Message, given that that functionality no longer exists in Home. When an F180 institutional administrator goes to their school setup settings, we suppress the form for setting logo and name and instead provide a link directing the user to go to branding configuration on Interfolio Home. Users see a graphic that that replaces the university name and logo config options from subsection A on Setup -> Details. The remaining config options from A (Term Designation and Login Name) remain in their own little section. A Faculty180 Administrator is able to customize the Institution name.